Over the past ten years, the McGreal Center has become home to twenty-one unique historical collections. The Center is blessed with many volunteers, interns, and graduate and undergraduate student workers who assist the archivist in preserving and making these collections accessible for researchers. From monastery archives to conference records to personal papers, the McGreal Center’s archives share the story of the Dominican Family in the United States from multiple perspectives, and through a variety of formats. Among its many unique collections, the Center holds the records for nearly all of the Family’s collaborative organizations in the United States. This article will focus on two of them: the Parable Conference for Dominican Life and Mission, and Las Casas: Dominicans in Ministry with Native Americans, Inc.
How often does one see interstate traffic backed up for Mass? 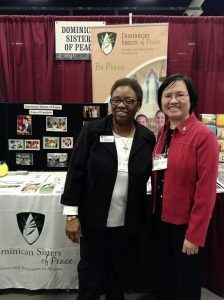 That was the scene on Saturday, February 17, as Sisters from the Dominican Sisters of Peace traveled to the Ohio State Fair Grounds for the Eleventh Annual Columbus Catholic Women’s Conference. 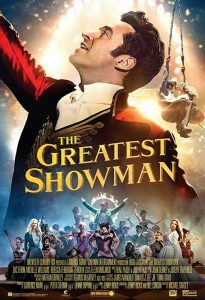 The Greatest Showman is a hit from the Christmas season, still going strong into February, quite unusual for a movie today, in which most are in and out of theaters in a few weeks. The movie is a musical biography of the 19th Century American showman P.T. Barnum, played by Hugh Jackman. Most notably, Barnum is credited with creating the modern day circus, with animal acts, acrobats, trapeze artists, and side show acts like General Tom Thumb, the smallest man on earth, and a bearded lady.